I've wanted a little Flatfender for a LONG time, I have probably looked at 30+ over the years but haven't been able to find the right one, at the right price and in the right condition. 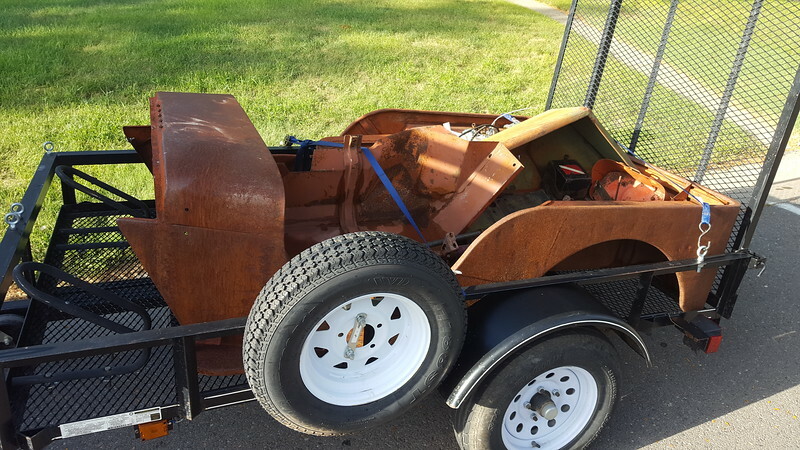 Well, that all changed last week when a co-worker mentioned that he knew a guy that had a tub and some other parts that he wanted to sell. I made a call, went to see what he had and made a deal. The tub is actually aftermarket, the fenders and windshield seem to be original. The windshield is from a CJ3a and the grill is one I've had for years, I'm told (by Rock-Taxi) that the grill is from a '47-48. 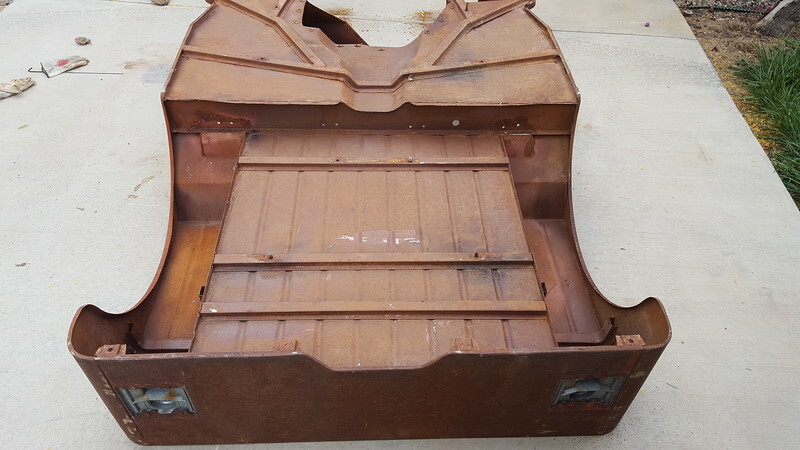 I think that at one point someone had a CJ3a with a rusty tub, so they bought and installed this aftermarket tub. Then over time, the CJ3a got parted out, engine, axles, frame, hood, etc, etc. All that was left was what I got. The tub looks like it was stripped of it's paint then left to sit outside for years. 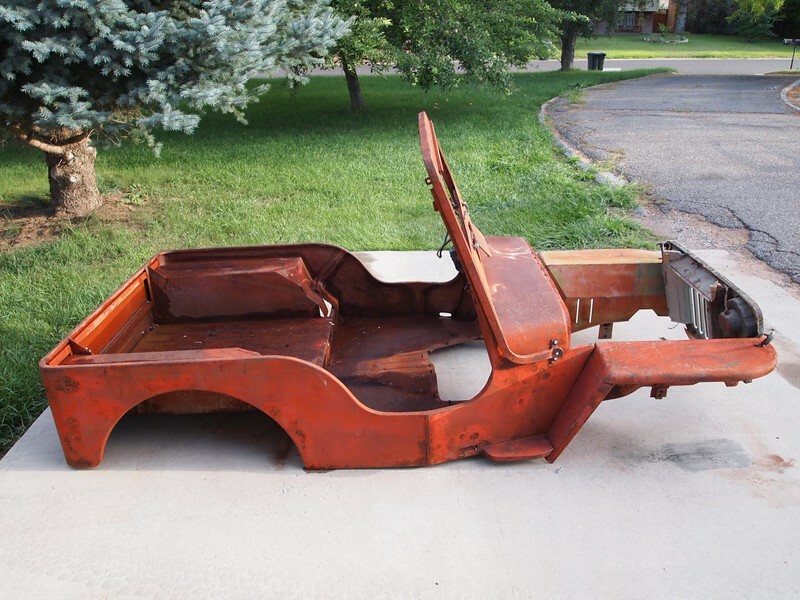 There is a lot of surface rust, but hardly any deep structural rust. 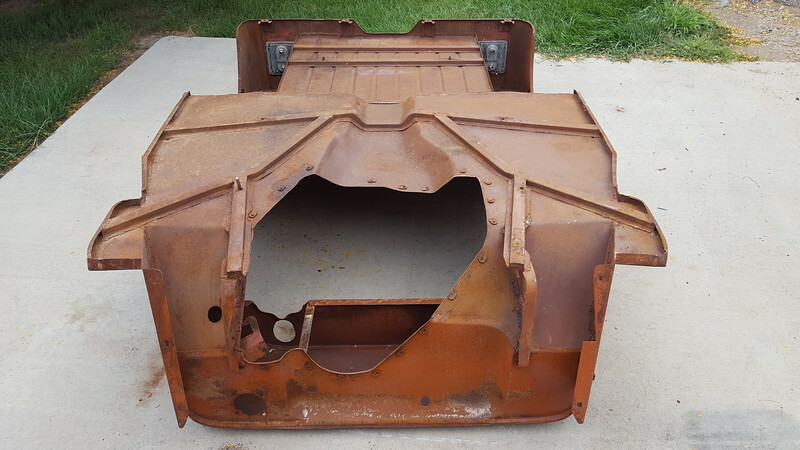 The other parts are in pretty decent shape, in terms of rust. So my plans at this point at a little up in the air... here's what I'm thinking, I don't want to turn this into a dedicated rock crawler but more of a fun driver that is still capable offroad. I'm thinking I'll keep it on 35's for this reason. Being that I'm 6' 4" I don't fit in a little CJ very well and since I'm without a frame, my thought was to build a frame and stretch the body to fit. 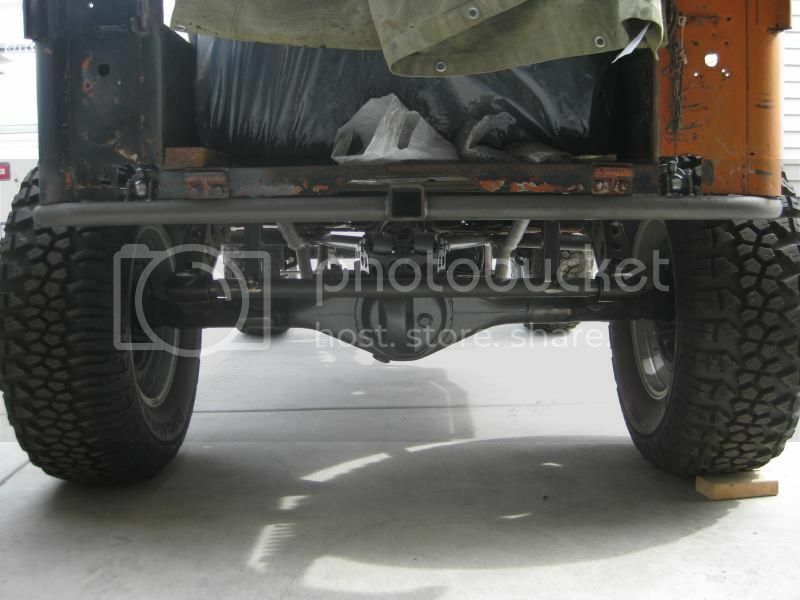 Either Toyota axles or Jeep Dana 44's w/ around 58" WMS-WMS. Linked suspension F & R, probably 12" air shocks on the corners for ease of packaging. 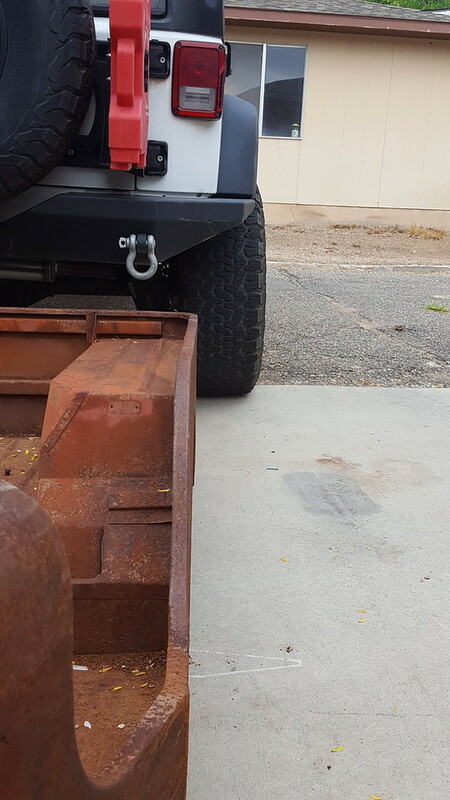 I'll probably stretch the door 8" or so, plus 2" at the rear wheel well. Shoot for around 90" +/-wheelbase. Then I started thinking that a V8 sure would be fun in this little Jeep, but packaging it under the hood is almost impossible. IMO a V8 will cost about the same as a V6, so why not consider it? 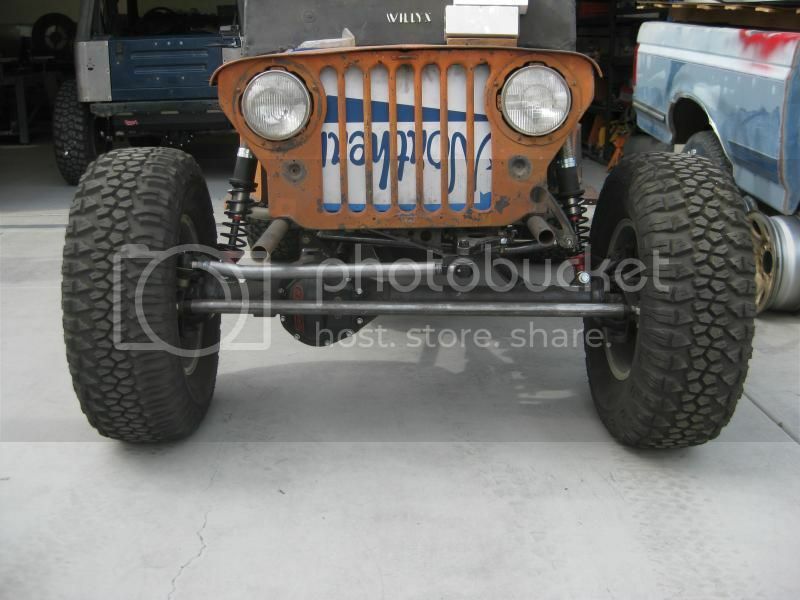 Plus the overall drivetrain will be longer, so I'd need more room for the rear driveshaft. So the second build idea goes like this. Linked suspension F & R, probably 12" air shocks or coilovers on the corners. Add 6" between the fenders and tub, stretch the door 8" or so, plus 2" at the rear wheel well. Shoot for 96" +/- wheelbase. And just for the sake of discussion...I don't like your JK axle idea. Here are a couple pics of mine with approximately 60" wide axles, 7.5" wide rims with nearly 5" backspacing (30mm positive offset), and 305/70/17 tires. You'll be adding ~5" of axle width, plus wider tires, plus probably some rim width also. I don't know if you can find wheels with enough offset to make the width what you'd want? They aren't the best pics since I wasn't trying to show the tires...but they stick out from the tub halfway or a bit more. Also, my front hubs stick way out from the wheels--you wouldn't have those in your case though. Yeah, I'm still back & forth on the idea of JK axles due to the width and t-case complications... your axle widths are pretty ideal, I really like where the tires & wheels sit at 58" WMS. I backed my JK up and centered the CJ tub to the JK and thought it wasn't ALL that bad. So my wheels are 9" wide and have 4.75" of BS so they have 4.25" of positive offset. You can get a set of Mopar Winter Wheels, IIRC they have 6.25" BS and are 7" wide, which means .75" positive offset and 3.5" less than my wheels. That would be 7" narrower overall than my JK. And they'd look much better with a weld-on beadlock (or just a beefier weld-on trim ring w/o beadlocks! ), but that would also add a little width. That would be pretty decent, IMO. Weld-on rock ring would work, but you wouldn't be able to do DIY beadlocks on those wheels--no room for bolts to protrude past the weld-on ring. My father in law has a willy's sitting in his garage... it is under boxes, etc, but the way things are going we might be able to see what he wants to do with it. He had the idea of a very stockish willys to drive around his property out near Duchene, but it looks like he is going to sell that property. We will be watching this. 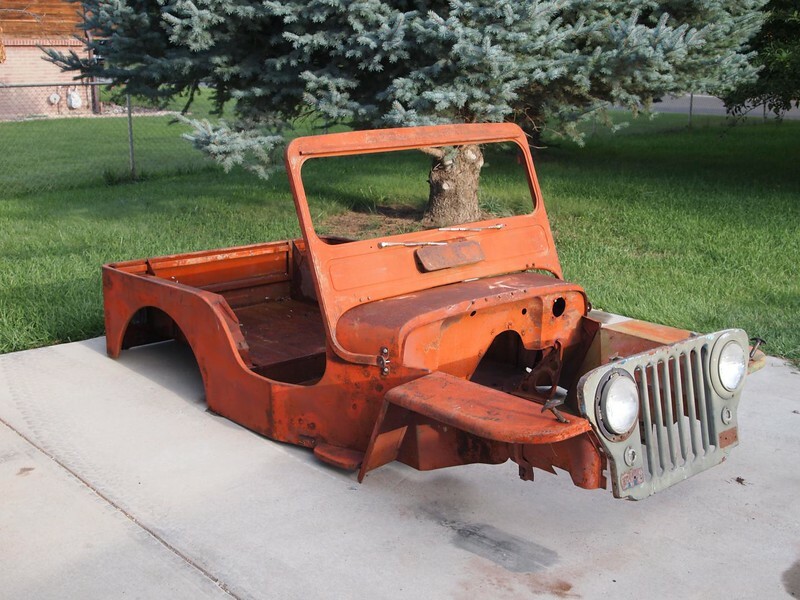 I think it would be fun to get a totally stock Willys back up and driving on the road, sounds like a fun project! Looks like a fun project. The body looks to be in great shape. I am currently rebuilding a 47 CJ2a. Keeping mine mostly stock to cruise around st George in. Looks great! Stock engine, trans, t-case & axles? Yep completely stock. Rebuild flat 4, changed to 12 volt, electric fuel pump. Saginaw steering. Pretty basic. Idea 3.... Rat Rod!! that thing just screams Rat Rod.. I like the idea, but would rather have a capable 4x4! I know a guy in Roy that does plastic media blasting if you want to go that route. He did my Silverado and turned out great. If you'd be interested I'll send you his number. Just clear coat the patinia. Bed line the inside and you got rat rod 4x4 . I would love to, but hauling it up and getting it back is the issue. There is a local guy here in Western CO that has experience blasting old cars and says he can clean up the body w/o damage. I don't need much paint stripped, just surface rust cleaned up. I'll probably use the local guy for convenience, but I do appreciate the offer! You're not the first to suggest it... problem is that I plan to stretch the tub and the patch panels, hood and grill won't ever really match. 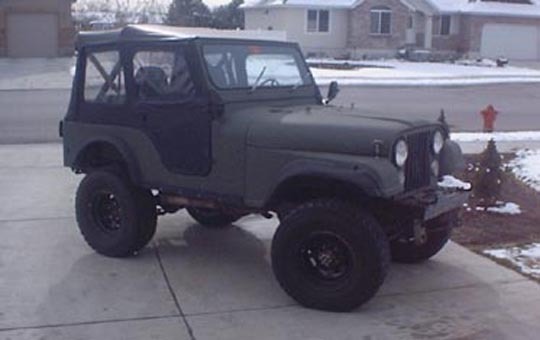 I really don't want to have it look all rusty, while I can respect that on some rigs I'm not going for a ratrod look with the Willys. 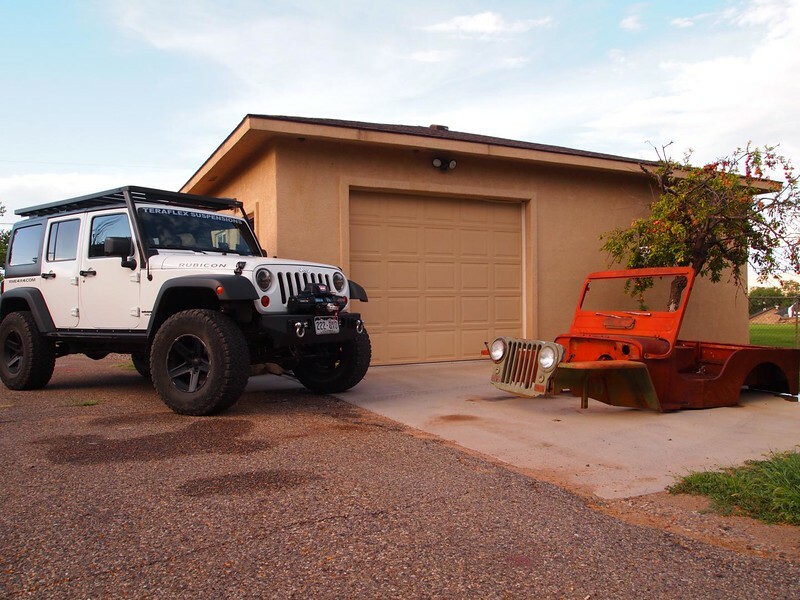 I want to Zolatone it like my old Toyota PU and CJ5... probably go for the same color that my CJ5 had, since it had a military look to it. Scored some parts this week, found a Dana 300 for $100! And a good mini-truck front axle for $150. I'm going to do a IFS Hub conversion on the front axle to make it 58" WMS-WMS, the pickup a IFS Toyota Rear axle, which will match the front at 58" wide. I think it will be a perfect width and well balanced drivetrain. Since most Toyota minitrucks have 4.10 gears I can run that ratio to keep the build affordable, then over time add a TRD rear 3rd member with a e-locker and eventually a FZJ80 front 3rd member with a e-locker. I'll probably just do a door stretch around 8" and think about tweaking the rear wheel wells... but still in the air on that one. I'm pretty excited about deciding how the build is going to progress from here. Love this project and plan. I looked for about a year to find a body like that to put over the Ranger buggy chassis.